Vanessa P. Gazzola concentrates on commercial and business litigation matters for the firm, advising companies and not-for-profit organizations on a variety of legal issues. Prior to joining Hall & Hall, Ms. Gazzola practiced in the areas of professional liability, employment disputes, and commercial litigation. She has also represented children in child welfare matters, and has practiced in the areas of business and intellectual property law. In addition to her legal career, Ms. Gazzola has experience in business development and as a marketing consultant. Ms. Gazzola received her law degree from New York Law School where she was managing editor of the Media Law and Policy Journal and executive editor of the Moot Court Association. In addition, she was elected to the Order of Barristers—a national honor society that recognizes law school students who excel in advocacy and brief writing skills. She received her Bachelor’s degree from Fordham University where she was on the Dean’s List for academic achievement. 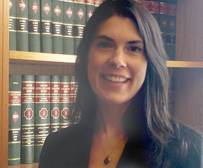 Ms. Gazzola is a member of the Richmond County Bar Association and is admitted to practice law in New York and Connecticut.